Black Butte Trail is the shortest route to Big Horn Peak and the Sky Rim Trail with incredible views. The trail starts in the trees along Black Butte Creek, then quickly climbs up to pocket meadows overlooking the creek. While it lacks the big open meadows of the Dailey Creek drainage to the north, the forests are open and pleasant to walk through. The trail steadily climbs, rarely losing elevation. After a few larger meadows, the trail eventually crosses Black Butte Creek where it begins to climb the ridge that connects Black Butte to Big Horn Peak. The trail spends much of its time in the trees with varying views. Keep an eye on King Butte to the northwest for brown, petrified trees standing amongst the gnarly, dark-gray cliffs. The forest continually changes depending upon elevation and the aspect of the slope. 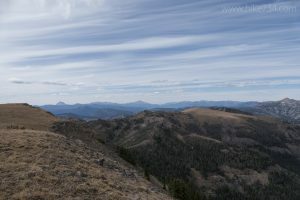 The trail eventually pops out onto the broad, grassy summit of Big Horn Peak and the junction with the Sky Rim Trail. Wonderful panoramic views in every direction are a great reward for the 3,100ft/930m climb. Explore the Sky Rim Trail before heading back down. Bighorn sheep frequent the area and mountain goats can often be seen on the cliffs of the north face of the peak. 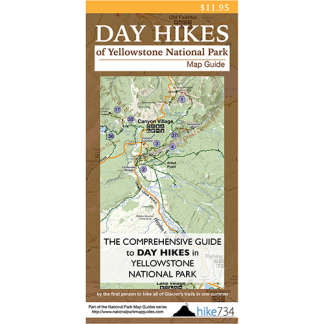 Trailhead: Located halfway between Big Sky and West Yellowstone on Highway 191, the signed trailhead for Black Butte is on the east side of the road. Parking is further south on the west side of the road.